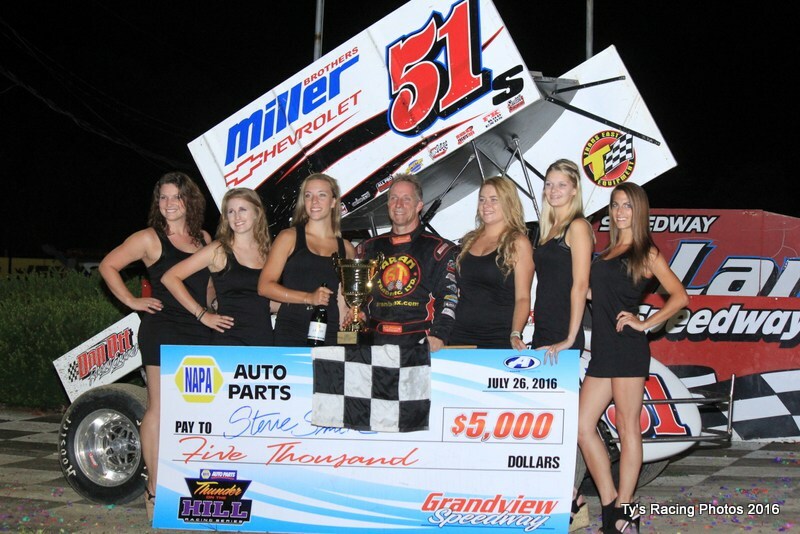 BECHTELSVILLE, PA (July 26, 2016) – Broken Arrow, Oklahoma’s Stevie Smith captured the 410 Sprint Car Thunder Cup trophy, the $5,000 top-prize, and his first career Grandview Speedway win this past Tuesday Night when the NAPA Auto Parts Thunder on the Hill Racing Series presented the 2nd Annual 410 Sprint Thunder Cup event at the Berks County dirt track. The race night sponsor was Pioneer Pole Buildings. Greg Hodnett picked up the win in the 410 Sprint car make-up feature event, rain halted from PA Sprint Car Speedway. Duane Howard claimed the 30 Lap, $3,000 NASCAR 358 Modfied main event while Craig VonDohren picked up the win in the 358 make-up feature event. Kunkletown, PA’s Ryan Smith started on the pole of the 35 lap Thunder Cup main event setting a rapid pace and hitting lapped traffic by the fourth circuit. Smith aboard the Warko No. 94 swapped grooves dodging lapped cars with Stevie Smith in the second position. Stevie Smith – the veteran – made his move on the fourth circuit pulling outside the ‘Kunkletown Kid’ – but it was the younger Smith making a bold move dodging between lapped cars to hold on to the top spot. A lap 10 red flag for Freddie Rahmer – who got upside down after contact with a lapped car – halted the action for the only time of the race. During the red flag, Ryan Smith discovered an issue with the radiator hose on his No. 94 machine draining the water out of his sprint car, handing the lead over to ‘The Black Bandit’ Stevie Smith. On the restart, Stevie Smith powered away while Tim Shaffer battled Danny Dietrich and Greg Hodnett for the second spot. With Smith at the helm at the halfway point, all eyes were on Myerstown, PA’s Brent Marks moving forward from the 11th starting position into the fifth spot. Smith held a full straight-a-way lead while Shaffer, Hodnett, Dietrich and Marks battled for the runner-up position. Dietrich would overtake the second spot and close on Smith through the later portion of the event but it was ‘The Black Bandit’ maintaining the lead and rolling under the checkered flag in first position. Danny Dietrich finished in second, Greg Hodnett in third, Tim Shaffer in fourth and Brent Marks in fifth. Tim Shaffer set the Quick Time with a lap of 12.603, Qualifying Heat Races were won Lucas Wolfe, Alan Krimes and Davey Sammons. Thomasville, PA’s Greg Hodnett claimed his ninth Thunder on the Hill victory dominating the final 20 laps of the rain-delayed 35 lap PA Speedweek feature event. Hodnett set a rapid pace from the get go, pulling away from the lead with Brent Marks in tow. Hodnett weaved in and out of heavy lapped traffic holding off Brent Marks – who was closing on the leader. Hodnett picked up the $5,000 winner’s share, Marks settled for second, Lucas Wolfe in third, Aaron Ott in fourth and Stevie Smith rounding out the top five finishers. Duane Howard, of Oley, PA, led the Mike Petruska Racing No. 66 to victory in the 30 lap NASCAR 358 Modified feature event. Howard started on the front row with Brett Kressley and charged to the front from the opening green flag. Howard switched lanes from the middle to the top spot holding off Kressley’s No. 357 machine. A lap 10 yellow for Boyertown, PA’s Ryan Watt slowed the field for the only caution of the evening. On the restart, Howard held on to the top spot with Kressley in second, while a three-car battle for the third spot developed between Craig VonDohren, Jeff Strunk and Modified rookie Mike Lisowski – with Craig VonDohren getting the best of the war. With Howard setting the pace, VonDohren charged around the outside of Kressley for the second position and set his sights on the leader, closing with five laps remaining. Howard would go on to pick up the win, VonDohren settling for second, Modified rookie Brett Kressley in third aboard the Norm’s Save Station No. 357, Jeff Strunk in fourth and Mike Lisowski in fifth – in less than half a dozen Modified starts. Modified Heat Races were won by Jeff Strunk and Rick Laubach. Oley, PA’s Craig VonDohren launched from his second place starting spot in the 30 lap make-up feature event, setting a rapid pace early on with Duane Howard, Rick Laubach and Jeff Strunk right on his tail. A bold three-wide maneuver around Howard and Strunk moved Laubach into the second spot setting his sights on VonDohren. Howard would pull pitside a lap later. Laubach closed the gap on the 12th circuit pulling alongside the race leader before retiring just two laps later. Strunk inherited the second place position and challenged VonDohren for the lead with five laps remaing. VonDohren would claim the $3,000 top prize, Strunk would settle for second, Jimmy Horton in third, Brian Hirthler in fourth, and Brett Kressley in fifth. The four feature show was completed by 10:30 PM, the track was groomed twice throughout the night to ensure optimal racing conditions. Davey Sammons pulled off early in the make-up feature event, the team went to work changing the motor prior to the heat race – which Sammons claimed the win over Brent Marks and Stevie Smith. Sammons finished 9th in the A-Main. Stevie Smith picked up his first ever Grandview Speedway victory – his father, Steve Smith Sr. won the first Thunder on the Hill event in August 1990.